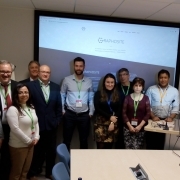 On the 22nd November 2018, the consortium of the GRAPHOSITE project met for the review of the first quarter of the project. This meeting took place at the offices TWI at Granta Park in Cambridge. Partners presented and discussed various tasks carried out since the launch of the project. The new project website and logo were also officially presented to the Project Officer. 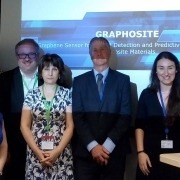 The GRAPHOSITE project started on the 1st August 2018. The kick off Meeting was held on the 3rd September at the TWI offices in Cambridge, with the participation of the Project Monitoring Officer from Innovate UK, who gave an overview of the monitoring process. This was a good opportunity for the representatives from the participating organisations to meet and discuss the future work on the project.